As a self proclaimed claysmith, I act as a midwife in the birthing of all things CLAY - beads, cups, pots, trays and rattles - which speak not only of the maker but the user and the society where the art of clay is permitted to flourish. was glazed with Duncan clear brilliance. earthenware and simply clear glazed. INTAGLIO Flexible Rubber Stamp Mats are now available on Shopify - check it out! One of 22 flexible rubber stamp mats offered for purchase on my Etsy site. The perfect doTERRA oil carriers for those bracelets you are making at Blue Santa Beads in Media, PA. This little guy decided to stay with me rather than go to Faces of Value this year. This Halloween ghost fits nicely over a battery operated LED flickering light! Impressed with a roulette from Barbara Palma, this rattle really has the feel of basketweave. These have a complementary necklace to go with them! New light weight earrings for Autumn wearing. 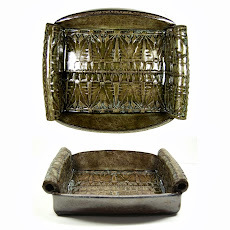 Black wax resist was used to draw the leaves on a bisqueware tray before applying multiple glazes. Emily Cohen's hand cut glass discs meet Gardanne's enameled charms to make a really cool pair of earrings! This time, I got to participate in the mix! 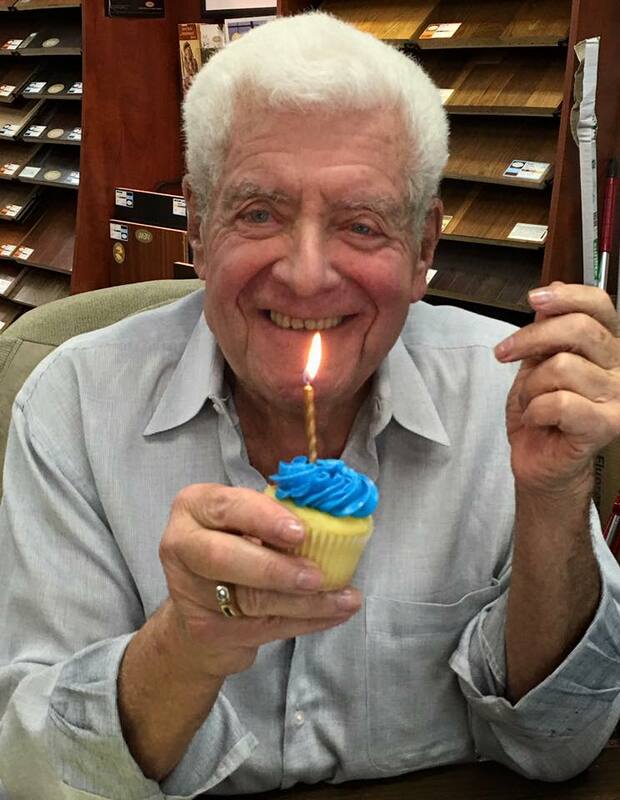 A memorable character from my past who made a lasting impression on me; he will be missed! 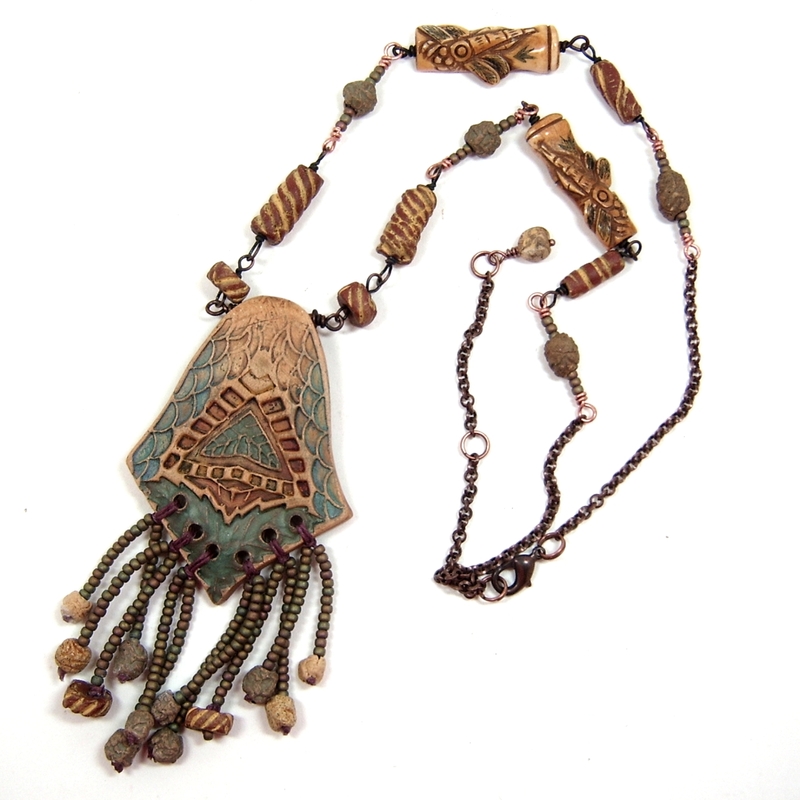 Accented with copper wire, charm and chains, these shards are reversible and make great carriers for essential oils. 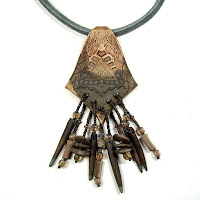 Even small tumbled shards stack nicely to form a focal pendant! Those vintage fluted aluminum jello molds of old make the cutest little dishes which make the neatest little glaze tests! 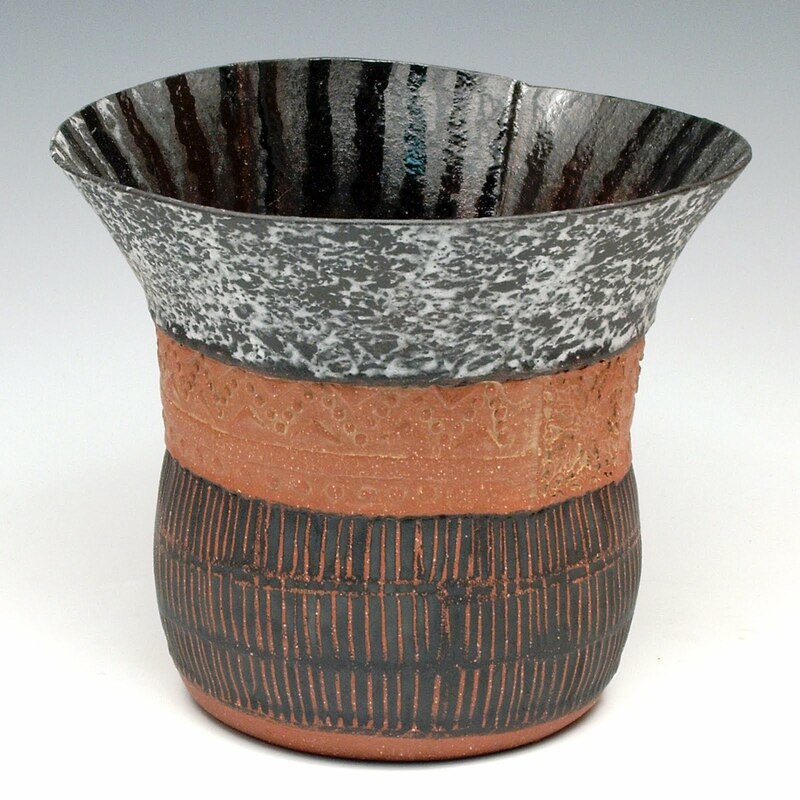 Formed from earthenware which was impressed with my Mayan Mayhem Intaglio mat and glazed with Amaco glazes. It's a Bird...it's a frog...it's a fish! 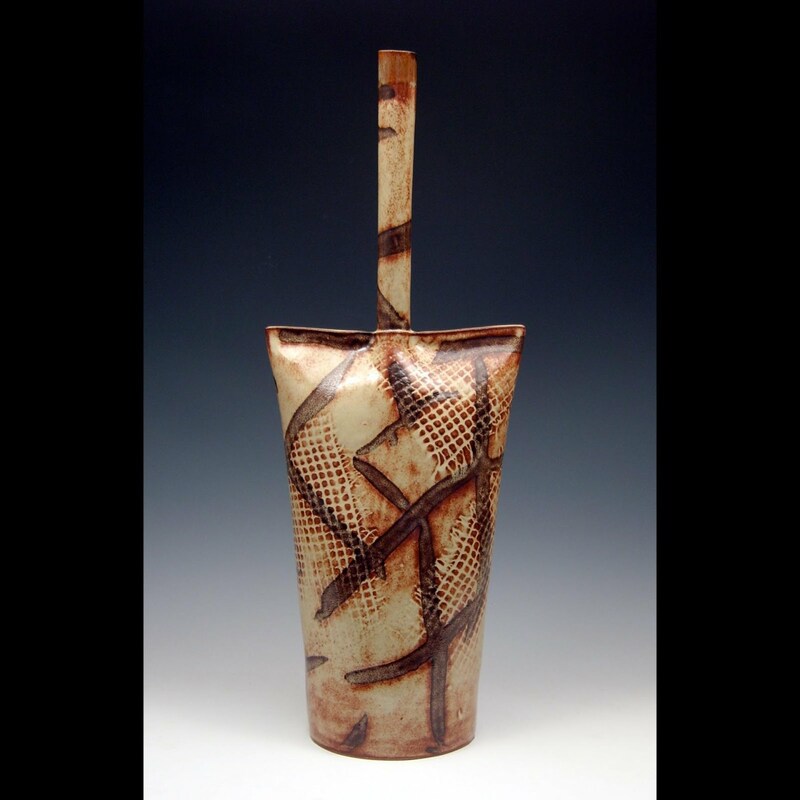 A hand built pinch strip cup with scratched terra sigillata base and carved accent band. Hand formed hollow ceramic clay beads carved and gas fired to cone 10 before being tumbled. Smooth from their 12 hour tumble! 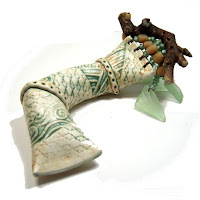 Thesee are the results of the hollow hand carved beads in the right column of this blog. Pinchstrip construction and glazed with Metallic Ocean out, Blue Hare's Fur in. A new glaze called Peridot from Stone Mountain Clay which when fired on the 266 brown clay, reminds me of the coloration of a box turtle. Compliment to the Paisleaf pot. 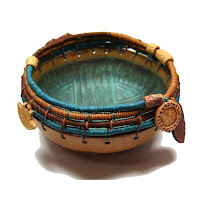 The 50th Anniversary Show of the COMMUNITY ARTS CENTER CLAY GUILD - This pot was impressed with my own carved stamping blocks and finished with Jade glaze then accented with natural leather and clay disc beads. Pinchstrip construction of earthenware with terra sigillata enhancement. 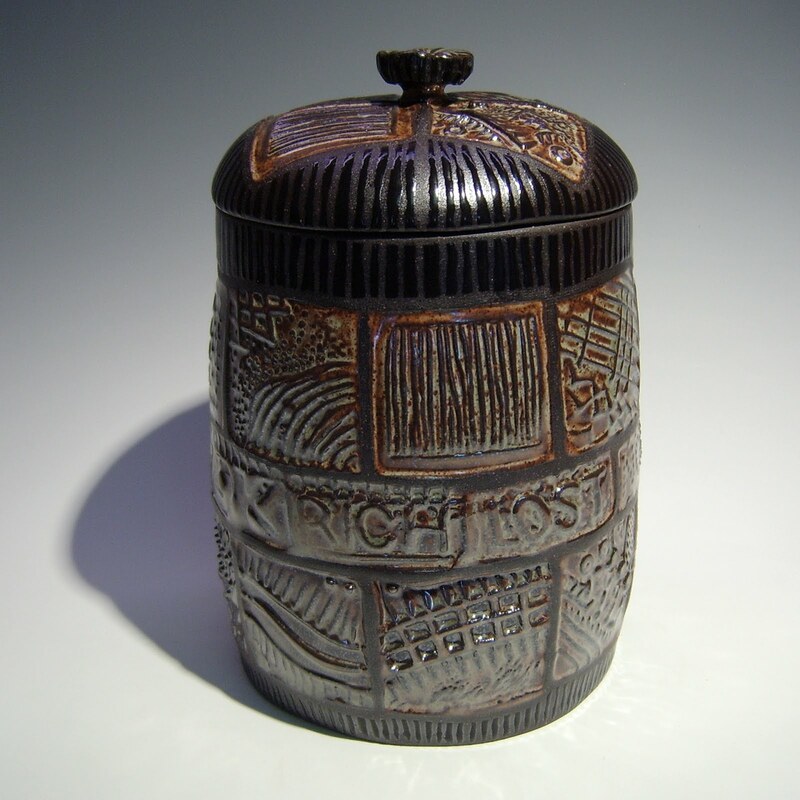 Lidded canister with zen-tangle patterning. 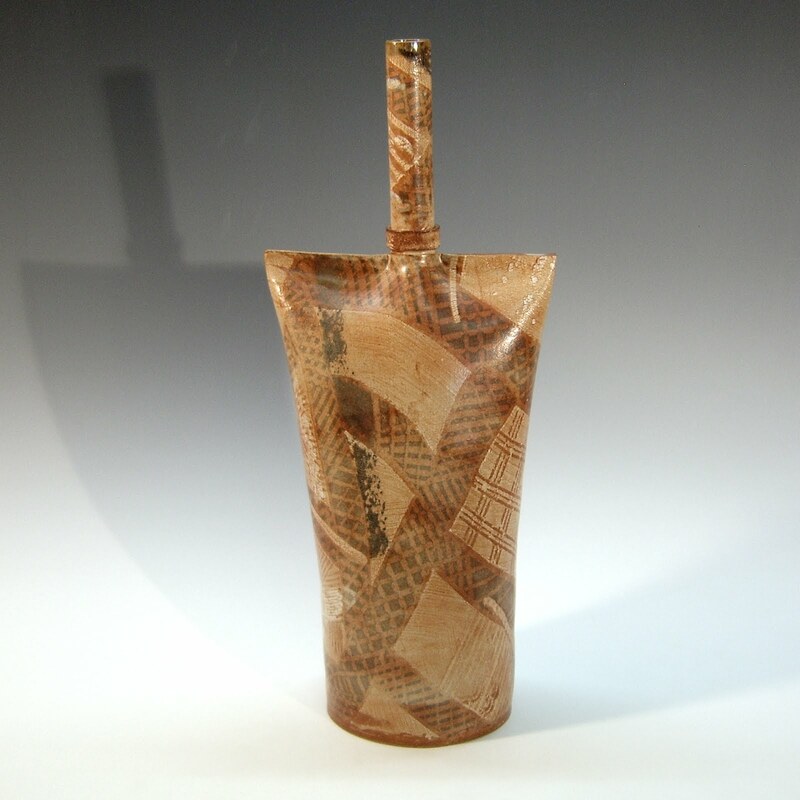 A svelt small vase with ceramic hangie-downs. 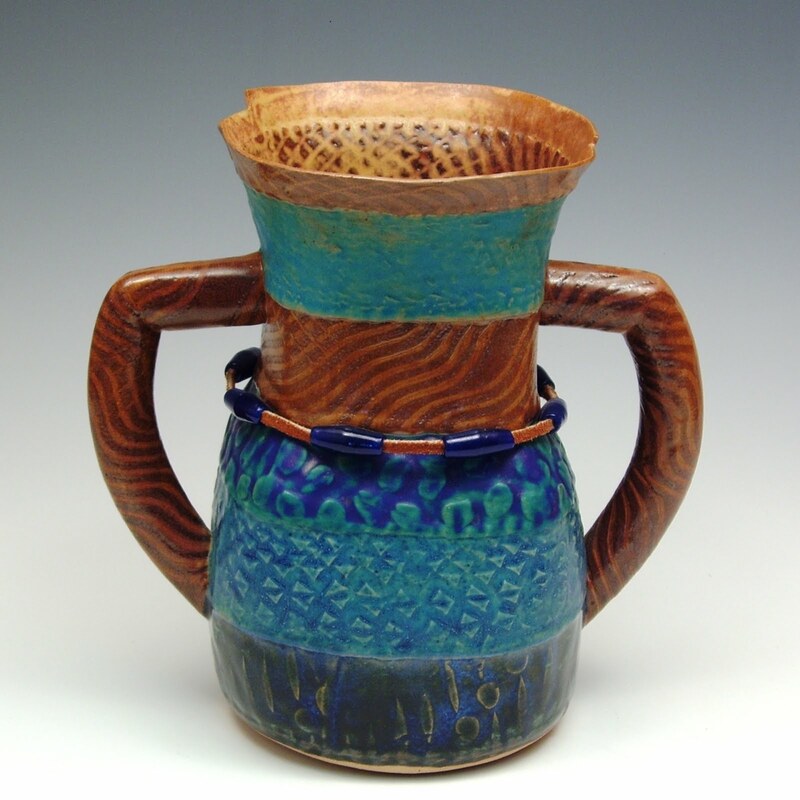 Hand built stoneware vessel 12" high. 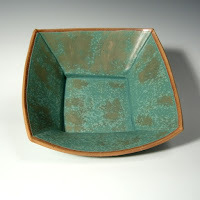 I bought a bowl from Hayne Bayless built like this and loved it so much I had to try my hand at making one. 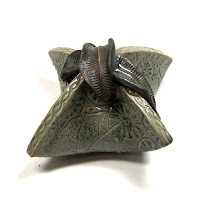 This earthenware box is a homage to Daniel Oliver's style of hand building. 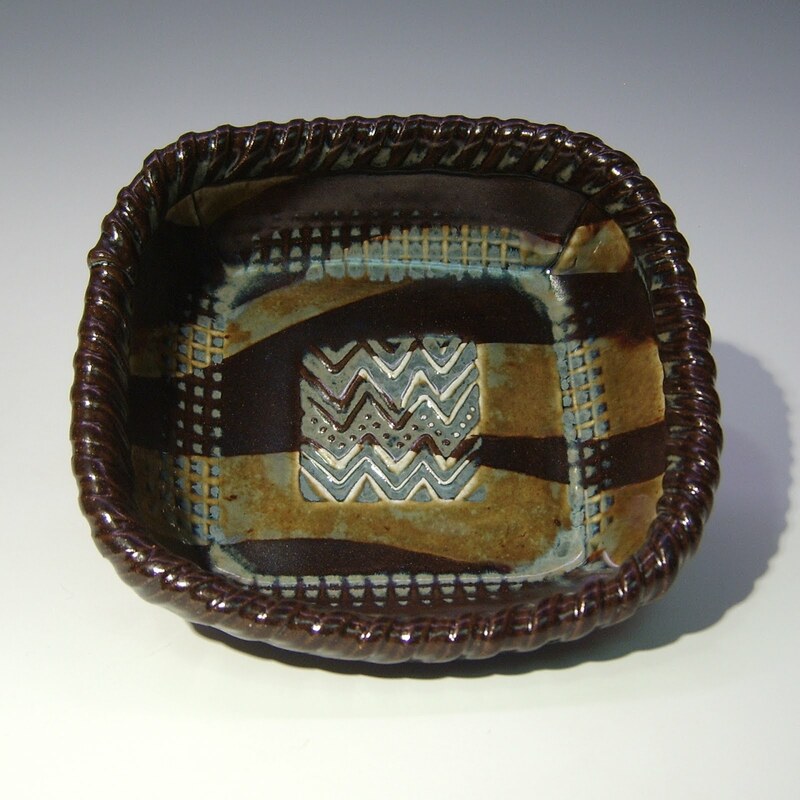 The box is finished with terra sigillata, stains and glazes. 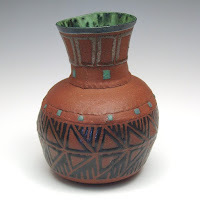 This 6" high pinchstrip pot was accented with wax resist patterning and a snappy inside glaze. Less than 3" high and perfect for a favorite pet or yourself. A companion to the Live Fly Bird Zen Cup. 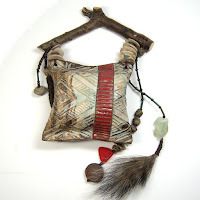 A medium size rattle bead decked out with seed bead strands which end in clay leaves and sporting a found wood handle. Stoneware surface enhanced with my impressing mat and found wood handle. This rattle grew from a hollow handle demonstration and my need to always find a use for something I form. Earthenware enhanced with my very own designed impressing mats! One side of this reversible jewelry component. 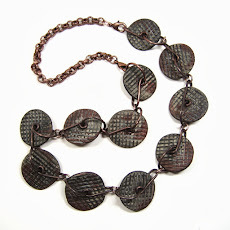 Hand formed and soldered rings join forces with these scroddled & terra sigillata enhanced beads to form an easy to wear necklace. A 10" square tray/plate made colorful with a stenciled design. Flourishes Intaglio mat impression in stoneware. Soon to be available at the new Schell House Gallery Coffee Shop in Schellsburg, PA. These are accented with carnelian cubes and amber. Just another way to celebrate Faces of Value - have you bought your ticket? A mask for Faces of Value happening April 21st 2016 at Cherry Hill Mercedes. 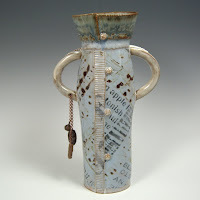 A 3.5" high pinchstrip pot accented with hand formed clay leaf beads and layered stoneware glazes. 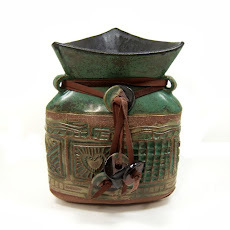 Accented with leather, hand formed clay beads and Ethiopian discs this primitive pot has been finished with terra sigillata and spot glazes with Amaco Artist's Choice glazes. Perfect for an aromatherapy necklace! 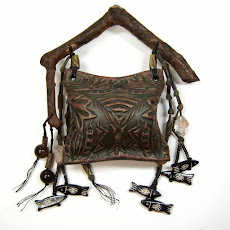 Combing through engobes on a slab of clay creates a wonderful clay fabric for the simplest of things! What's More Fun than a Single Tapas Side Dish? Putting a little gesture in the pitcher! 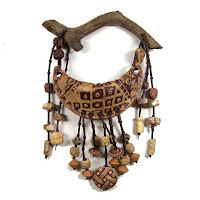 Hand carved ceramic clay hollow beads being offered through Etsy. Form two small balls of clay, one slightly bigger than the other. Form a pinch pot over your thumb using one of the balls of clay. Thin the edges of the pinch pots so they go together nicely. Place two pinch pots together easing one inside the other. Scratch the clay around the middle where the two pots join. Then smooth out the scratches with a soft rib. Compression roll the hollow clay ball to smooth the outside. When firm to the touch, begin to carve your hollow bead. 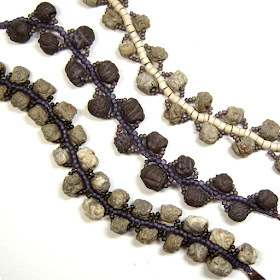 The last thing to do is put holes for stringing in the beads.. 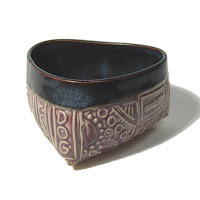 Different clay bodies combined to form this bowl then glazed with Lynne's Glossy Grey. 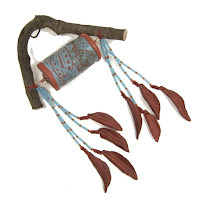 Subtle coloration accented with a found wood handle give this pillow rattle it's appeal! Tan & Chocolate Stoneware 18" high. Another piece impressed with an Intaglio mat. 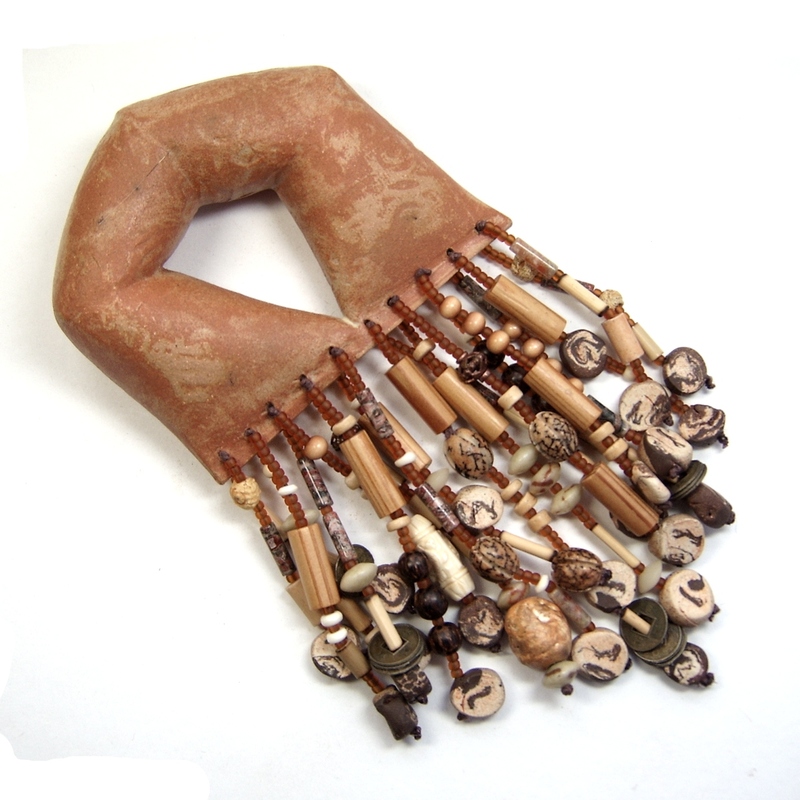 When Leslie Pope returned this bead to me unsold, I immediately made it into an adorned rattle with found wood handle. A decorative pillow rattle accented with red glaze and sea glass haging from a found wood handle. 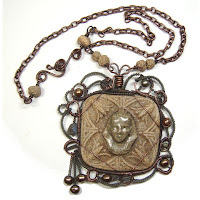 This piece was patterned with my hand carved 2" square stamping blocks and accented with wax resist lines while glazing. 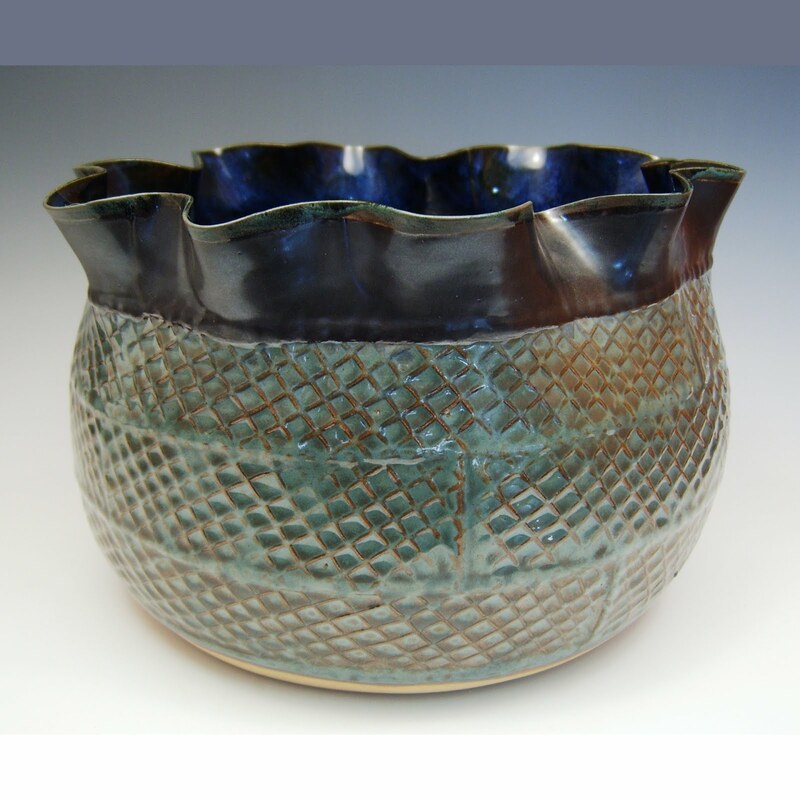 It is 9 - 10" tall and about 6" round; even the inside of the lid has been glazed with a pattern! 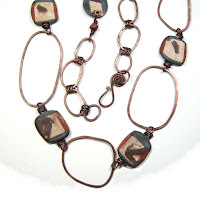 Clay Neck Collar made from stoneware squiggles tipped with copper discs and blue Fluorite semi-precious beads. 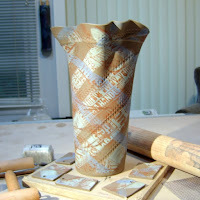 This picture shows the vase as greenware before the initial firing. 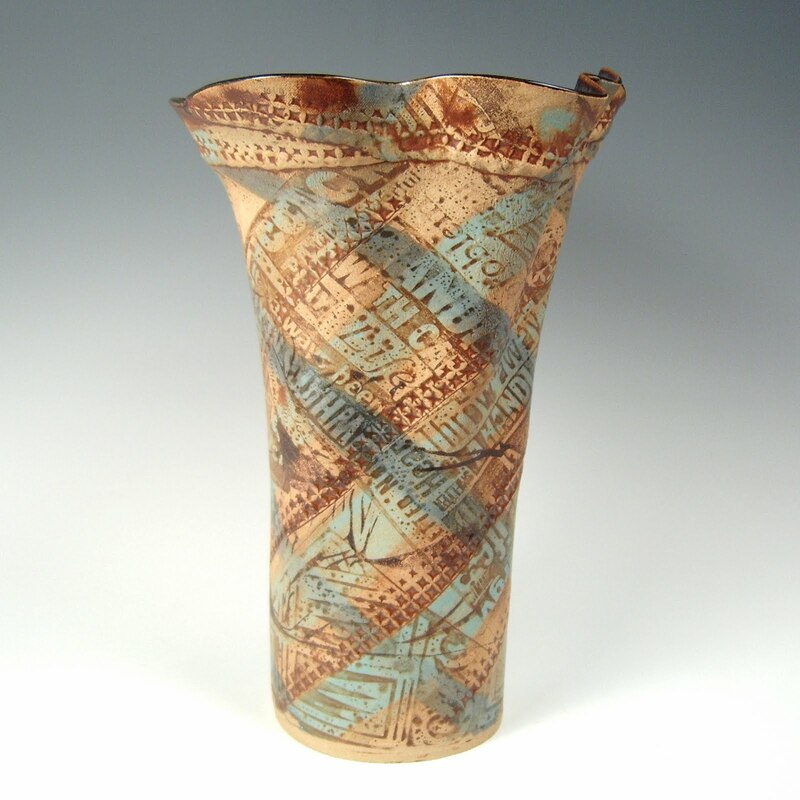 This slab built vase showcases both the print to pot technique plus the use of engobes to enhance the clay surface. Hammered copper wire arches surround these hand formed blue green Burlington clay Easter Island Guys. I designed the shape of this press mold to compliment the patterning in my Intaglio mat. 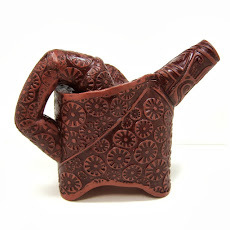 A hand built pitcher/watering pot. BH 905 Green Leaves Lidded Box about 5" square x 3" high. 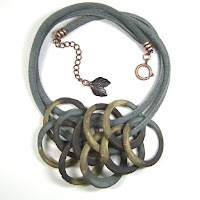 Double suede cords and stoneware clay rings form this necklace. Easy to wear, easy to share! Earthenware pinch pot finished with incised terra sigillata outside and a blue haze glaze within, only 1 3/4" h x 2 3/8" round . 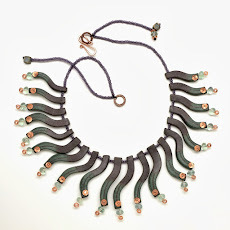 Copper Wire and Reversible clay focal combine to make a sculptural statement honoring the jewelry creations of Alexander Calder. BH 880 splayed leg and dome lidded round box is only about 6" high; compact yet compelling! BEST IN SHOW (from Bucks County Guild of Craftsmen in honor of Palmer Sharpless, Yellow Breeches Guild in honor of Roy Dewalt & the Haverford Guild of Craftsmen) awarded to the Egyptian Bowl, Edges and Borders, The Pennsylvania Guild of Craftsmen Lancaster Fine Craft Show November 2010. 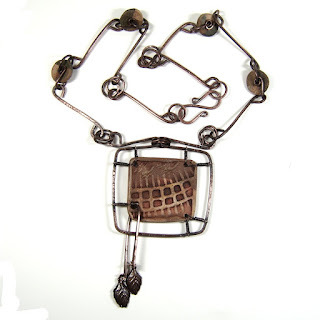 A reversible wire wrapped plaquette necklace.